With an auto install feature you will have the theme set up in under a minute. And if you want to get to know Buddy a little better, the theme comes with detailed documentation and top-notch free support. Nowadays any theme will work with BuddyPress/bbPress, but Buddy is actually built as a BuddyPress/bbPress theme meaning it styles all the BuddyPress/bbPress pages to match the theme. However if you don’t want to use BuddyPress and/or bbPress, no problem, the theme doesn’t require it and works just fine without it! This theme uses shortcodes to create the homepage. The shortcodes come with a ton of options and can be moved around the page meaning there is unlimited possibly for homepage layouts. The default homepage set up comes preinstalled with the theme. The theme is completely responsive meaning the theme adapts to any screen size from a large computer all the way down to a mobile device. Try it for yourself, resize your browser window and see how the theme changes to fit the window. All the latest Apple products display things at a higher resolution, meaning your existing website images look a little pixelated or blurry on these devices. Retina displays will become more common place in the future so consider this when purchasing a theme. This theme offers total retina support by using font icons instead of image icons and doubling the image resolution on retina displays to ensure your website looks crystal clear. 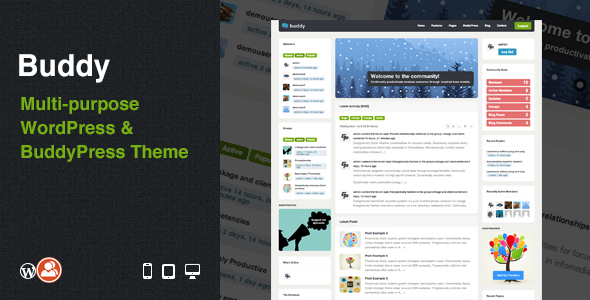 Share the post "Buddy: Multi-purpose WordPress"